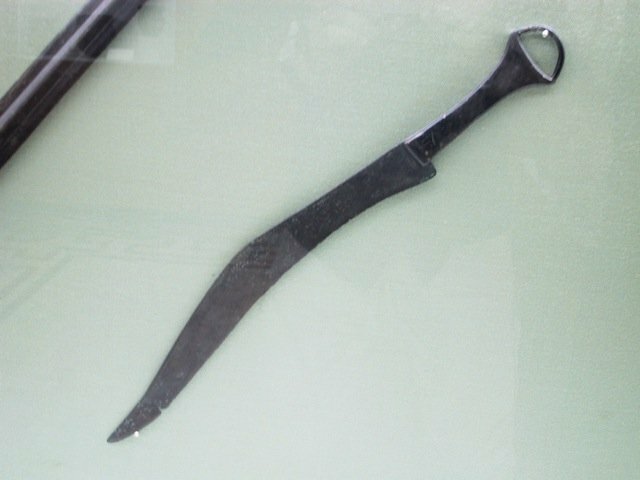 clunaclus (culter) –sacrificial knife, called clunaclus because it splits the “clunes”(haunches) or something like that. The general picture we get from this word list is that the term culter and scalprum form the basic terms for knife in the tool and ritual sense and the specifics of the knife's function come through adjectives. There are some exceptions like novacula and secespita. Notice that the weapon sense is lacking, except maybe when used as “sub cultro” to be under the knife, as in being in danger, but even then sacrifice and and butchery could be the source of the metaphor. 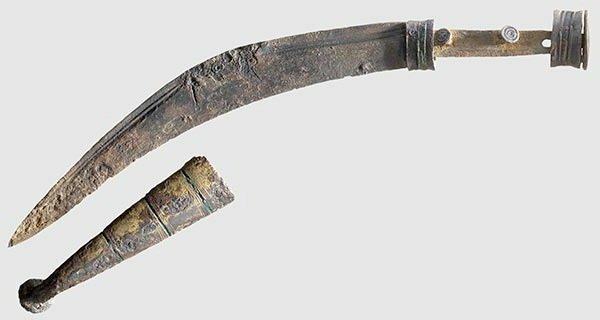 Falces are literally pruning hooks or sickles and then military implements—it was the name of a seige weapon, too. The word itself, according to Lewis and Short, is probably related to “flecto” and the term is more a reflection of the implement's shape than function. Pliny uses the word to describe boars' tusks. Unless I'm mistaken, a boar's tusk has a gentle curve, not a sharp bend. It's interesting to note that Valerius Maximus, Suetonius, and even Ennius (“Illyrici restant sicis sibinisque fodantes”--note accusative first conjugation rather than third) use the verb confodio/fodio with sica in its sense as an actual weapon. It's a vivid word, originally used to describe digging up soil and came to mean to stab. Pugio appears with all manner of words for striking, stabbing, etc., but for sica, fodio/confodio is like a vox prop. If there's interest, I'll post more of my findings about Latin knife and sword vocabulary and Greek sword vocabulary and what I cross reference with the Oxford Latin Dictionary about knives, when I get my hands on a copy. I was going to do Lewis and Short's sword vocabulary as well as other weapons, but there's about three times as many entries to get through for swords alone, and this took me too long as it is. I should say one last thing: this doesn't really change what archaeologists call things. The Greeks and Romans are fast and loose with their terminology and often make no distinction where we'd really really love one. A gladius in one line, may be an ensis in another, and may be an “acies” (literally just the sharp part of a blade) in another yet. The lyric poets (I'm thinking of Tyrtaeus and Callinus) used the same word for shield as Homer, but their shields were entirely different. This is just a quick and incomplete catalogue of how Romans talked about knives. Thank you for this digging and display of words. I love to learn more about the actual terms used by romans as it shows us some of the mentality and beliefs surrounding sharp edges and their uses. "The sica was a short sword or large dagger of ancient Illyrians, Thracians and Dacians, used in Ancient Rome too. It was originally depicted as a curved sword, (see the Zliten mosaic as well as numerous oil lamps) with a blade about 16-18 inches long (40 – 45 cm) and many examples have been found in what are today Albania, Romania, Bosnia, Bulgaria and Serbia, as well as depicted on the Trajan's Column." "Sicarii. To the Romans the weapon seemed to be one used by criminals.Sicarii the Jewish rebels in ancient Jerusalem practised terrorism against neutrals during the Roman occupation." 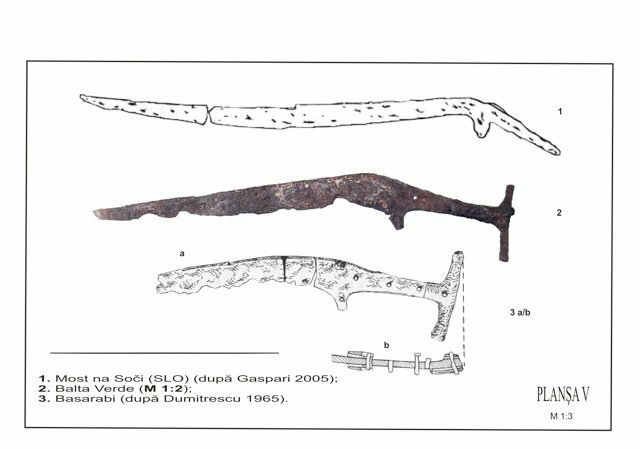 "The Romans regarded the sica as a distinctive Illyrian weapon, used by inhabitants of Dalmatia and present day Croatia, parts of Bosnia, Herzegovina and Albania (in present day Albanian language Sica = Thika). [dubious – discuss] The name Sica could also be related to the modern Croatian word Sječa meaning 'to cut' or 'cutting'. Although a short curved sword was used by several peoples around the Mediterranean the Romans regarded the sica as a distinct Illyrian weapon used by the stealthy 'assassin' (sicarius)"
I shall post some images of original knives in a while. Although identified as a foreign weapon, it was seen in Rome both in the arena in the hands of Gladiators, as well as in dirty and in murderous situations in back alleys. 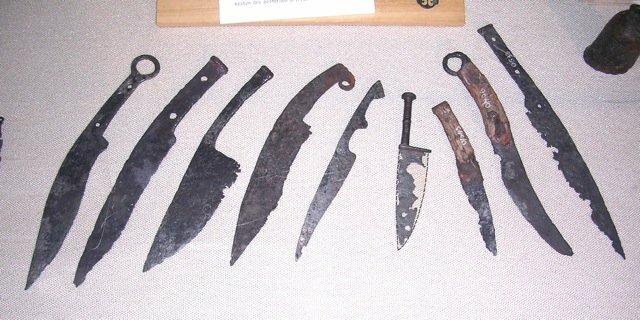 There are many knives that has the recurved for of the edge in various sizes found in roman sites. 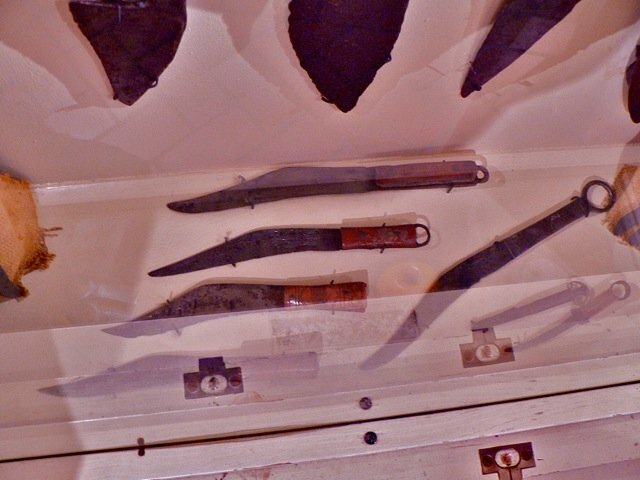 It seems to me it was a comon enough shape for the knife even in Roman domesic use, but perhaps these smaller knives had enough of difference to the larger Illyrian daggers to merit a different name and recognition? To my mind it seems that the moment a domestic knife was used by an asassin, the "foreign" aspect of the weapon might have been appreciated and expressed? And then again, it is like Tyler pointed out: definitions and names were a rather fluid thing. The knives themselves, regardless of what thy might have been called back in the day are beautiful even if sometime very sinister looking. Jeff, only in a very oblique sense are culter and cult related. Culter originally meant something like a ploughshare (cf. English word coulter), and cultus originally had the meaning of labour, care, or even methods of husbandry--applied first to the land, then to the human mind and spirit. Note that the outline or curvature varies. Some have a smooth curve along the back, others an angular shape. Thanks for your reply, Peter, and thank you for posting photos of originals. I'm a little concerned about how far the conclusions of the wikipedia article go. The statement that the sica was used by criminals, e.g., is really based on how Cicero used the word, if you look at the footnotes. Valerius Maximus and Ennius seem to be the source for the Illyrian identification as well. It's a problem inherent within Classical studies that the evidence is so damned spotty. A former professor of mine used to say that studying classics was practicing the ars nesciendi -- the art of being ignorant. I'm disinclined to believe that an everyday knife would become a sica by its criminal context. It's kindof a rare word, it's a foreign word, and in the sense Cicero uses it, it's already doing some heavy literary lifting. The sense you're looking for is artificial in our own languages--a folding knife used in a stabbing doesn't become a switchblade or a balisong at the time of the stabbing, a fixed blade knife doesn't become a dagger--except very poetically. When Cicero uses the word against Cataline, I think he's trying to delegitimize Cataline's position even further. A modern parallel would be if Barack Obama had a photo of him holding a saber--someone would call it a scimitar or a shamshir. I'll confess I know nothing of the sicarii, apart from seeing a stone relief carving of them in a slideshow. They seem like a sticky wicket for my position that the word was more or less literary in use. Ennius, Cicero, Valerius Maximus, Pliny, and Suetonius were all part of a certain elite culture--they all probably spoke Greek in private, and they all loved to show off their verbal acumen whenever possible, preferring the archaic over the modern, and the obscure over what's clear. How the word was taken up by Jewish rebels, I have no idea--a fearsome, unroman force? It seems for every one Latin word the Romans used, the Greeks had five of their own. So not surprisingly, this list is much longer. Many of the terms are medical and specialized, others are completely general in meaning like kopis or makhaira. Notice that smila from the Latin list is really a Greek word smile-(long e). χαλκός khalkos bronze, but also used like sideros above. I'd be happy to answer any questions you may have about a word or meaning. I've also heard that gladius itself may have been an import word from the celts, and ensis the native latin for a sword. Hence "gladius Hispaniensis"- literally, the Spanish-type of sword called the Gladius. Sounds redundant if it was known that the gladius was already a Celtiberian style of sword, but no worse than we see all the time in phrases such as "the Japanese Katana", or "Turkish Kilij". Certainly the word gladius has cognates in the gaelic languages. 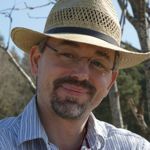 I'm writing this because I was surprised to see Dave Stephens refer to Peter Johnsson's beautiful rail road spike knife and his own (gorgeous) knife as sicae. My gut reaction was that this was simply not the case. While I won't speak for Peter or Dave, I will say that what I generally do is to be inspired by historical forms. It's a railroad spike knife! Of course it's not an accurate reproduction of an exact type of knife identified by specific nomenclature dating to an exact year and context. It's romantic, playful fun. That being said, I do enjoy the educational conversation. When asked what kind of knife it was at the hammer-in, I referred to its source of inspiration: the Sica of classic times. To my understanding this was a name for a weapon that was recognized by people in roman times. I never intended it to be an academically exact naming, as it so obviously was a personal take on the theme. Nor did it occur to me that someone would think I had such intentions when I made a rail road spike knife. The source(s) I have for naming knives of this form as Sicae are not from studies in classic literature history. I do not read latin. I comes from reading contemporary research on roman military matters and weapons of the time. Among these modern historians the naming of this kind of weapon as a Sica seems to be accepted as good nomenclature. This situation might be similar to the naming of certain weapons as Seaxes or Saxes today. 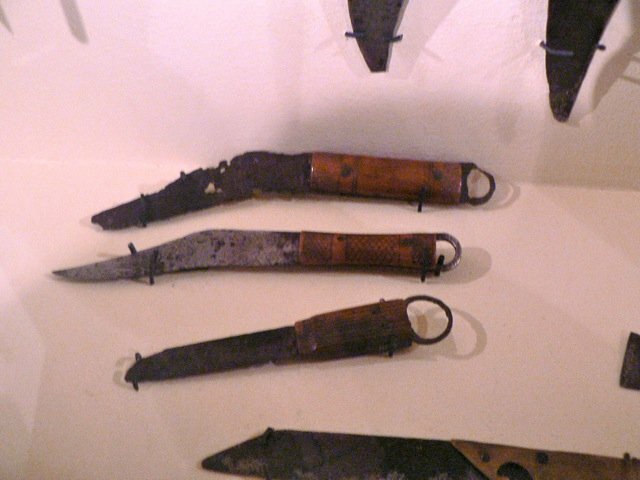 We know it was a period name for certain types of singled edged knives/short swords, but we cannot be absolutely sure what kinds and types were included in this meaning back in the day. Nor can we know what these weapons were called by all people who used them. There could well be local variations to the naming of them. I know nothing about this, and use the definition established by todays archaeologists. To a student of latin literature it might seem like a flawed conclusion to call this particular form of knife a Sica. I cannot say anything about that as Latin and classic litterature are outside my personal expertise. In my case I have to rely on research that focus on military matters and weapon of the roman world, since this is the area that I am closest to in my work. I am very interested to learn more about period nomenclature however. It can shed a light on the objects that survives as archaeological artifacts. Al, not so (redundant that is). Jesus Hernandez is both an owner of Quesada Sanz' seminal work on the Iberian panoply and a Spanish speaker as well so I reckon he should chip in on that. However from what I have read there's plenty to indicate that the purported Gladius Hispaniensis is not related to Gallic blades. 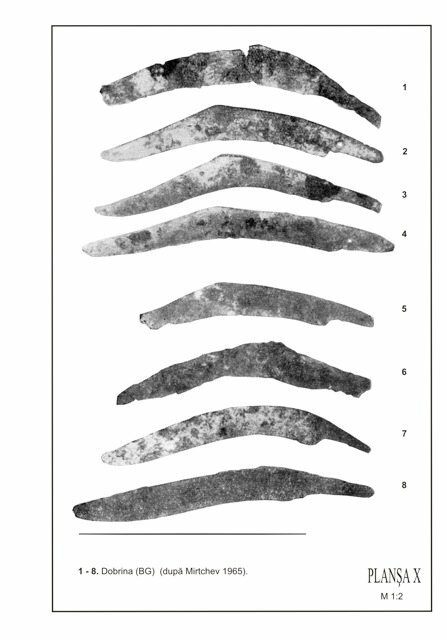 Where both cultures overlapped the La Tène blades available are simply mounted in the Iberian style but are distinctly different from the native morphologies, the few instances where there's influence from across the Pyrenees don't seem to represent a significant shift in style, so it does not seem to have succeeded. You may go to the sub-section that reads 'Tipos de Armas' and then click on 'De tipo La Tène'. Gladius is simply a general term for sword, so the use of Hispaniensis in this context is thoroughly justified and appropriate (as much as saying that Russian rifle, or that English longbow [or Welsh for accuracy's sake] may be be justified). Cool topic Peter and nice pictures. I have the book for the I Daci exhibition that was put up in Italy (in cooperation with the relevant Romanian museum) but there's not much in the way of weapons in the catalogue, plenty of tools and other ornamental stuff tho. Which sometimes leads me to think that as the Romans paid dearly for their conquest of Dacia and seeing how much they dreaded the falx, they might have well made a point of destroying as many as they could, certainly there's no evidence of what happened to the tonnes of arms and armour portrayed in Trajan's column. Except the word "Hispaniensis" already means "Spanish sword", so why add the additional word gladius? 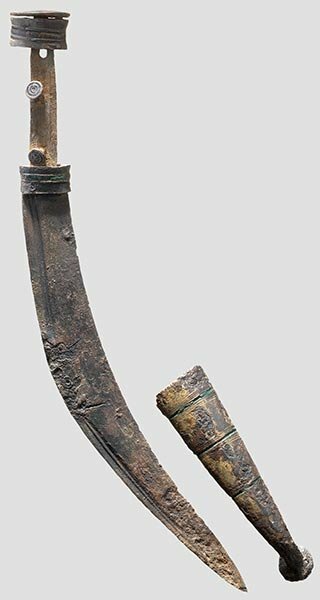 In addition, I believe there were swords carried by the Celts that were, both and size and shape- and therefore, most likely, function- very similiar to the Roman gladius. Actually, "Hispaniensis" just means "from or in the style of Spain." Ensis is just a modifier meaning from or of. Icus and ianus are the same modifier, it just depends on the root word to be modified, as in Germanicus meaning "of Germany" and Virginianus meaning from Virginia, although that is later post-medieval usage, of course. The "is/us" is the actual signifier here, the other letters in front are based on Latin syntax. As Alan pointed out that's incorrect Al Massey. Aside from the likely propaganda put forth by Polybius on the Gallic sword (for which actually Radomir Pleiner shows plenty of evidence of little to non-existant heat treatment) I can't see why Rome would laud one enemy's sword (The Gladius Hispaniensis in question) and diss the other's (The Gallic sword). With all due respect, you may believe what you like but evidence points to the contrary (the link leads to the world's scholastic authority on the matter of Iberian swords and Roman weaponry in the Iberian context). Also, description of the way Gauls went into battle does not match the notion that their swords would have been used in the same way as the Romans would have... a predilection for glorious one-on-one duels being preferred and a known lack of formation and discipline... which funnily enough isn't the case with the Iberians and the Dacians, which might be why of all the provinces these took the longest to conquer in terms of manpower and logistic expenditure (quite the opposite to what happened in Gaul). Ta Alan. I did much of the reading for my wife's dissertation (Classics) but she's the linguist, I focused on aspects of military history and weapon production through the network of fabricae. I missed this post the first time I read this. You're right to point out what you did about historical inspiration and play. I'll admit that I can be one hell of a stick in the mud when it comes to stuff like that. I'm sorry if I offended anyone with this thread. I posted not to squash anyone's fun, but because I genuinely respect Dave and Peter's work. I would say that for some smiths on here (myself included), Peter's posts count as research and it was with that in mind that I posted. "There are, however, some words of such a nature that they express the same sense by different sounds, so that it makes no difference to the meaning which we use, as, for instance, gladius and ensis, which may be used indifferently when we have to speak of a sword. Others, again, although properly applied to specific objects, are used by means of a trope to express the same sense, as, for example, ferrum (steel) and mucro (point), which are both used in the sense of sword. This may support Peter's suggestion that "sica" referred to any knife used with sinister intent, but a passage from the Ludicra Historia offers a folk etymology that says the word comes from a gladiator saying "sic pugnabo" (I'll fight this way) when his sword became bent. Make of that what you will, it may defeat my argument that the weapon was considered foreign. I've also been looking for depictions in vase painting, murals, and sculpture of every day knives. 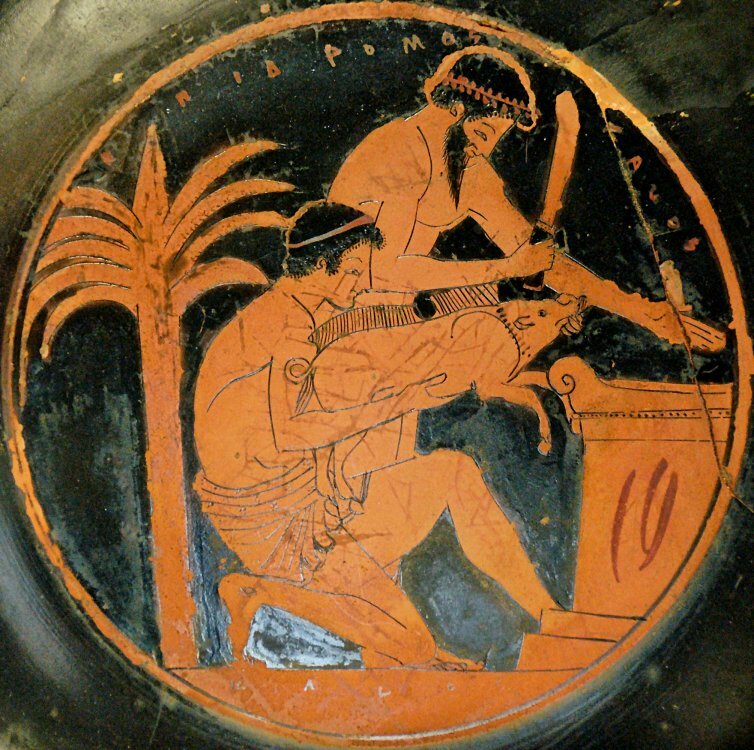 I've had a little success finding depictions of sacrificial knives in vase painting. The Roman wall-painting seems to be late, and it's the only depiction of a Roman sacrificial knife I can find. That doesn't mean more don't exist, it's just what I can find. Sorry for the pic sizes! A comic depiction of a sacrifice. 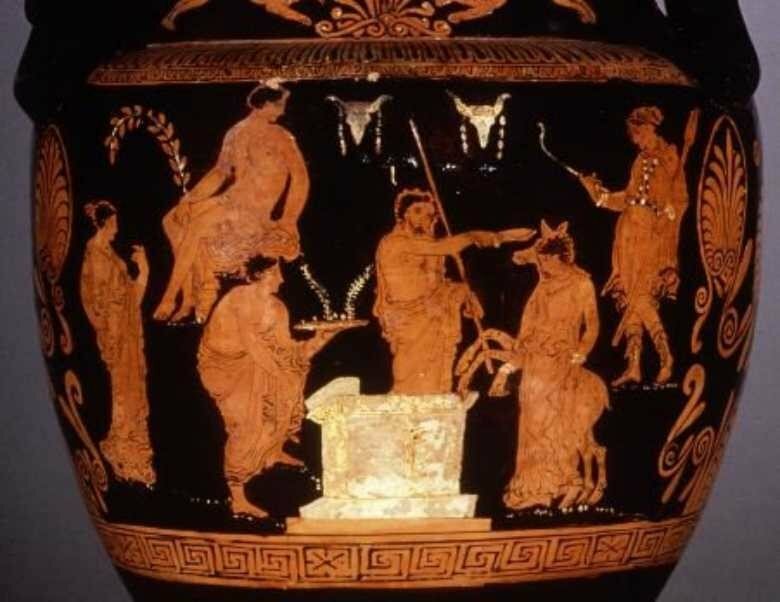 I'm sorry it's a copyrighted image, but it's the only depiction I could find of this particular vase. I think that counts as "fair use" for educational purposes. If any of the moderators aren't cool with it being here, let me know and I'll remove it from the post. A depiction of Agamemnon's 'sacrifice' of his daughter, Iphigeneia. 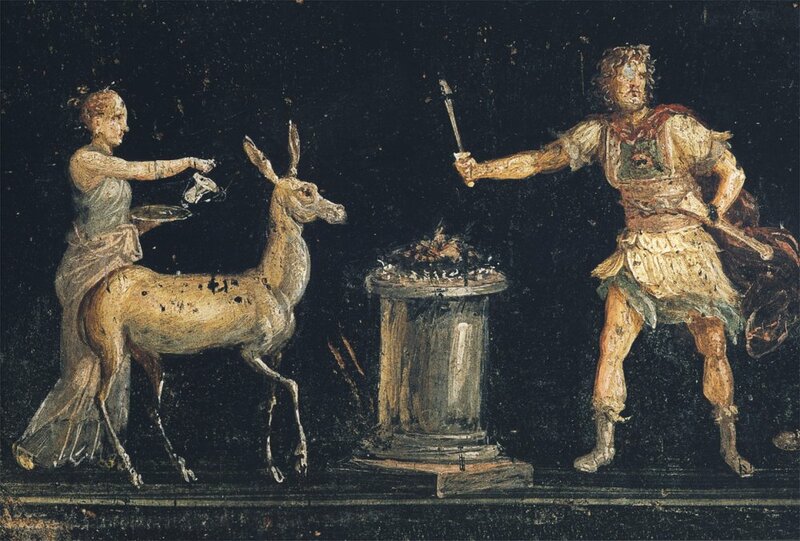 Note the "double exposure" of Iphigeneia and a deer--this refers to a specific telling of the story where Iphigeneia wasn't actually killed--the version of Euripides' play "Iphigeneia at Aulis" that has been handed down to us. Tarporley Painter---one of the best vase painters in the genre. The black-on white is the oldest, I believe. The red on black vases form a 5th-4th century BC cluster, with the Iphigeneia vase probably being the youngest of that group. Tyler, I really appreciate the work you do on this. I much enjoy reading your results. There is one point that confuses me however. I am not sure exactly what the point is that you debate. -Are you saying there was no such knife called "Sica" in roman times? It is certainly a widely accepted name amongst archaeologists. The term is accepted among historians of arms and armour. 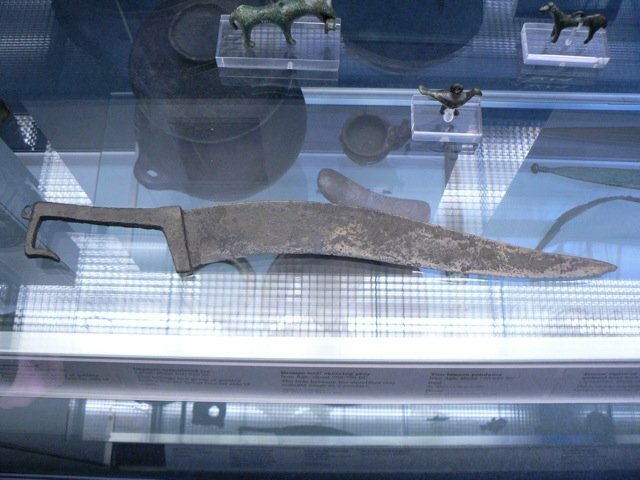 We know the sica was a weapon that was iconic for the warriors in the balkans, but that the knife type was common all around the mediterranean. The shape has very old traditions, going back to the bronze age. We know the word "Sica" was known by roman authors. -Are you debating the use of the term "Sica" among roman authors? We know cut throat criminals could be named "Sicatores". It is at least an accepted fact among historians. 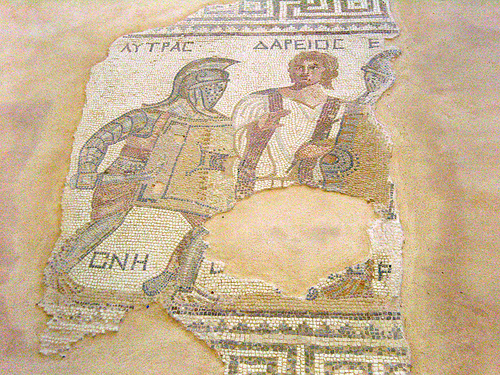 Historians who research gladiatorial fighting all agree that the Thraex gladiator was armed with a Sica in the arena. 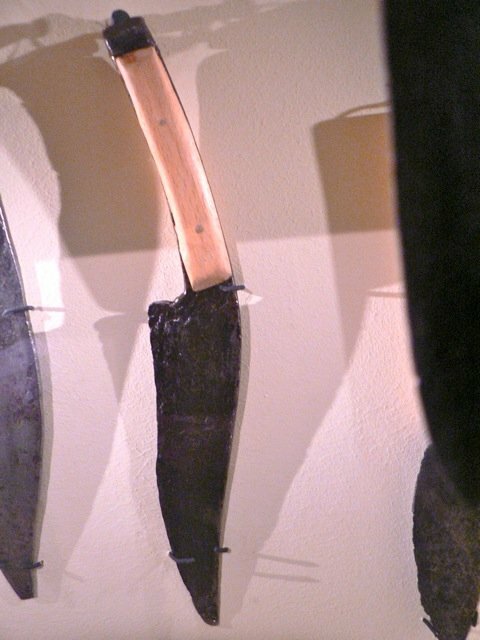 The gladiatorial weapon might well be different in its design than the weapon from the balkans or its cousins in kitchens all over the mediterranean, but that does not change the (very strong) possibility that anyone alive in those times saw the very strong resemblance between these blade types. -Are you saying that a knife of this general type did not exist in roman times/roman culture? That is certainly not true. I have seen numerous examples from Britain, to Spain and mainland Italy and the Balkans. By contemporaries, it may have been identified by its famous use by some foreign nation, just like the Scots were famous in their use of the broad sword in later times. This does not mean no other nation were using broad swords, or that the broad sword is uniquely Scottish in origin. If authors in Roman times knew a blade they termed the Sica, and saw it used by criminals and gladiators, it can still be a knife that is common in their own culture. Its famous/infamous use as a weapon may be referred to as foreign, however, just like anything barbaric or murderous is made even more fearsome by being given a foreign origin. I fail to understand why the use of the word Sica cannot define a type of knife we know both from the find material and the sources in roman times and in roman culture. -Why would you say such a use is incorrect? Perhaps I am simply misunderstanding you. So while I really enjoy your posts I am still confused about the reasoning behind them. -Please keep the research up! I look forward to learn more. 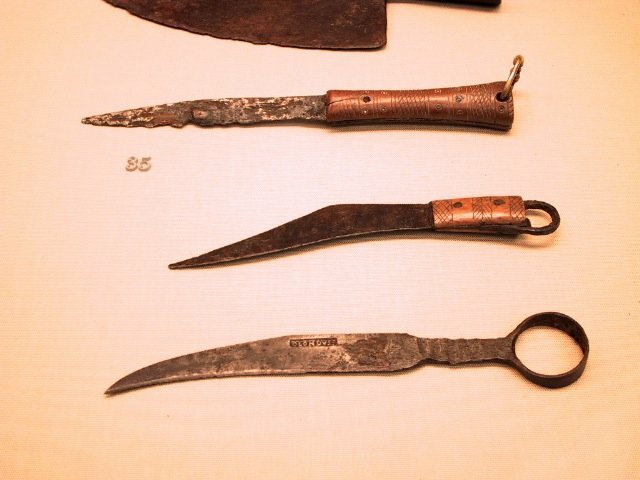 Below are some examples of crooked knives and short swords from around the roman empire. There is more. I have just posted a few snap shots from museums and online articles showing how common this type of knife form was in the roman period. We know that crooced knives were sometimes called "Sica" but we can naturally not know if all were known by this name, or if there were other names as well. I would think there was. "A well loved child knows many names" is a Swedish saying. A few more examples to show the ancient roots of this design and its widespread use all over europe since the bronze age and onwards. we know the design was popular and saw many variations in shape and form. We know it was used from scandinavia in the north to the areas north, west and east of the mediterranean, and in the regions in between. 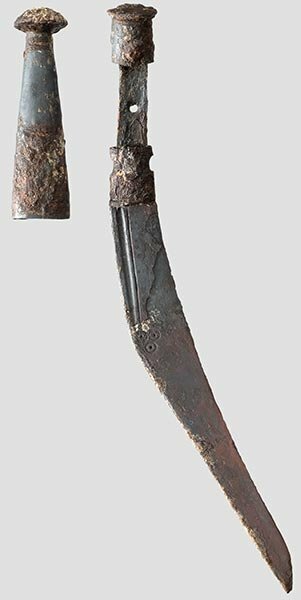 We know crooked knives were known as "Sicae" (spelling/grammar?) by roman authors. It was the blade used by the Thraex gladiator and it was a knife with sinister reputation. What we do not know is exactly what type of crooked knife/sword that was included in the "Sica" nomenclature by ancient authors. I do not think we will find a standard or a "truth" that is always applicable here. These things vary over time and region. 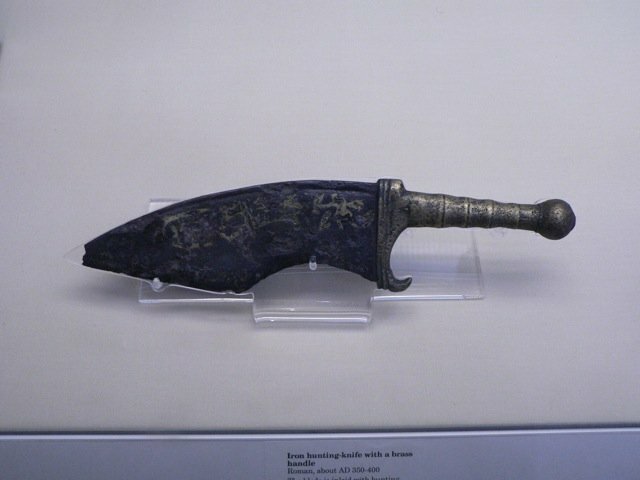 When I make a knife of this type, I term it Sica, if its inspiration or origin is a knife that was used in roman times. In Iberian or continental celtic culture it would be known by some other name. 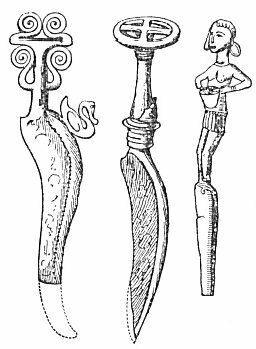 The greeks ma have called the design "machaira" or "rhamphe" depending on its size and degree of crookedness (or any other number of terms: Tyler´s list of Greek words form bladed implements is wonderfully detailed and rich). I posted what I did because I wanted to say I'm still working on this stuff and because I wanted to say I wasn't as right as I thought in my arguments. I'm not the most verbal guy ever and I probably didn't get that across well enough, if at all. I apologize. Quintilian illustrates my point about how the Romans were fast and loose with language with a view towards immediacy and impact and, it could be argued, he provides evidence that 'sica' maybe isn't a specialized term. The Ludicra Historia illustrates a Roman attitude toward the sica, regardless of where the weapon originated, the Romans thought of it as a gladiator's weapon--not foreign, like I had originally argued. I posted the photos because those were the fruits of the beginning of my search for images of knives. Sacrifice was the first place I looked, and that's what I got. Greeks would call those sacrificial knives kopeis or makhairai. It's easy to see why they'd be called kopeis--they do their work with a percussive slash: a chop. 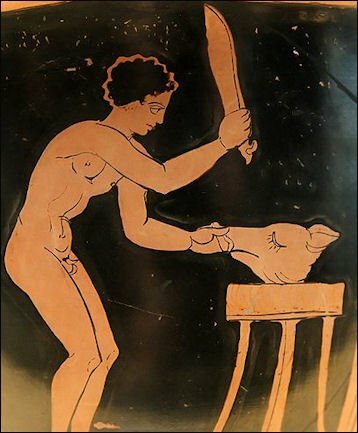 Regardless of size, an Athenian Greek would probably call any knife or sword used that way "kopis." I apologize for not really drawing conclusions about any of the material, but that's the result of a Greek/Latin language fan who hates to be wrong. 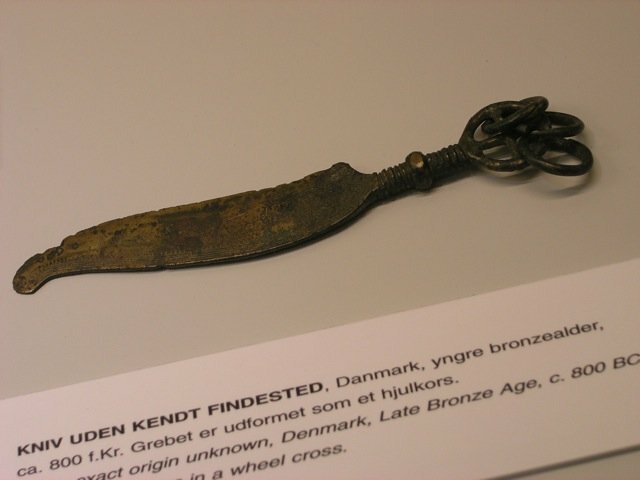 The goal with my little project is to post a bit about the language and how it was used around knives and swords, and then some classically produced depictions of knives and swords. Essentially trying to present what archaeology doesn't, through primary sources. This started as a raised eyebrow in the direction of the word sica, but in the process I've realized I didn't know as much as I thought about knife and sword vocabulary--so I've been posting what I've found and learned. It would be a great pleasure to me if someone interested in doing research on the topic used this thread to compare against historians--they draw their conclusions from the same primary sources I'm using. I'm working on a vocabulary of Latin sword parts (and maybe a Greek counterpart--if I can find enough on it), but I disagree with the lexicographers on some points and I'd like to get everything right, so it will likely take a while longer. My database reader is also terrible--for every instance of sica or its variants, it shows 10 instances of "brassica" (cabbage), and about the same number of "physica." So that's a lot of unnecessary work. I want to say one last thing about sicae, though. You said "What we do not know is exactly what type of crooked knife/sword that was included in the "Sica" nomenclature by ancient authors. I do not think we will find a standard or a "truth" that is always applicable here. These things vary over time and region." I disagree and I will set out to prove that we can have a "good enough" standard. 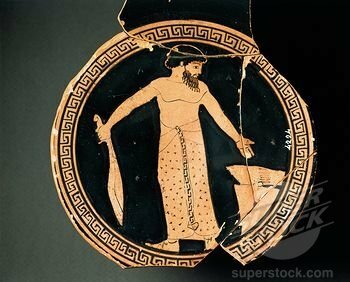 Every single depiction of a gladiator holding a curved blade, shows the blade held like that, convex side down--or at least brandished it in such a way that convex down must be the grip. This is opposite to how a kopis/makhaira is held. It does, however, match perfectly with that vivid word "confodio" which really means to dig up soil. It also matches with the quick kill reputation of the sica. A stab that way becomes a disemboweling on the way out. Based on the evidence, yours and mine, I feel this is a necessary conclusion. 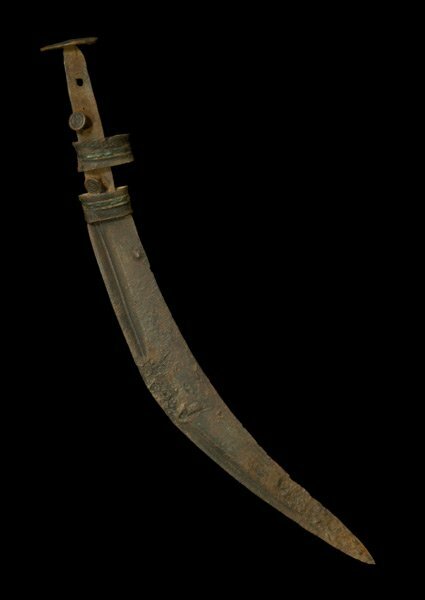 The sica is a curved, stabbing weapon meant to be held convex side down, a "kopis" a chopping implement or weapon, held convex side up. The Dacian sicae on this thread are the only blades really capable of what art and literature tells us a sica does. 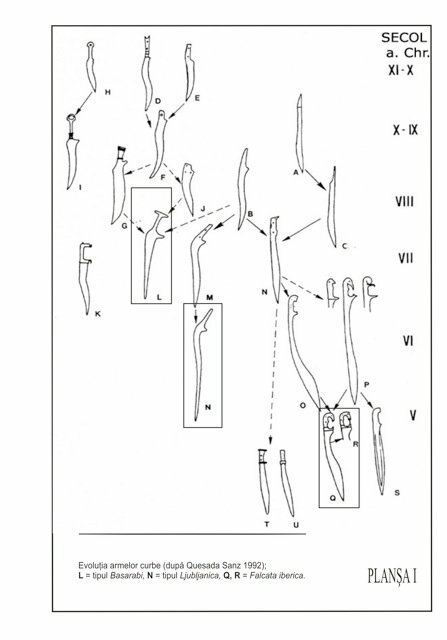 Well, those and maybe a few of the Romanian blades in the image marked Plansa X. And with that, I promise never to post another word about sicae unless it's to post one I've made. On a less corrective note (because I really hate being that guy), I really love that Venator's knife. May I suggest that it is both a sacrificial weapon and the property of a venator? Venator properly means hunter. The animal fights were often mock-hunts. Roman hunting was done with dogs, horses, and slaves holding nets. The hunter would then have to finish the captured animal. This would count as a sacrifice to Diana, I'm sure, and the means of dispatching the animal would be the same as a domestic animal. 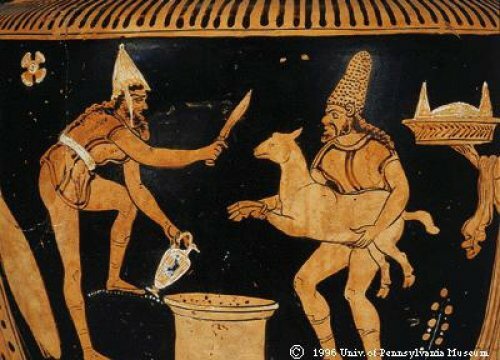 Notice the same shape of knife is used by Agamemnon to dispatch "Iphigeneia" the deer. 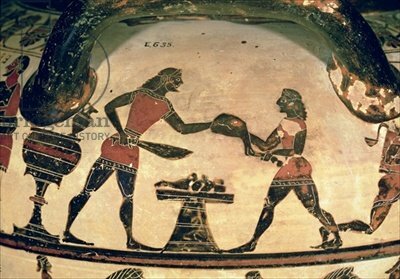 Also, that vase, the Tarporley painter's vase, and the vase with the woolly capped men all come from part of Greek-speaking Italy: 4th and 5th century BC Apulia. Fascinating, eh? The two vase images with machete-looking blades come from Greece proper, I believe. I also want to thank you for posting all of the images you did of the progression of curved blades. They are a treasury of information. It is remarkable that the same styles of knife show up in so many places and demonstrate such similar evolutions independently of one another. It leads me to believe the reason for the design is to overcome a technological limitation of some sort--perhaps an answer to unhardened blades? Tyler, thank you for your dedicated digging. I really appreciate it. I shall get back with some more details on the gladiatorial use of the curved blade and the weapons of the venatores. The information I have is from published research on the topic: what I post on this is based on the research of scholars in the field, not my own guesswork. I agree with you that within the group of crooked knives/blades you will find those that are made to be more like chopping/heavy slashing blades and others that are made for acute cutting and possibly stabbing. I am sure that despite similarities in overall shape the ancients made a distinction between such. Even so, you will find blades of both categories both in civilian use and as weapons. That is why I say that there is a carry over in meaning and that a kitchen knife may have been called a Sica when put to sinister use as a stabbing/cut throat weapon. -What is a "dagger" after all? We can all agree on some basic aspects it must have, but with all the variations, you will see numerous weapons that are clearly daggers and still sit mostly outside the general definitions. 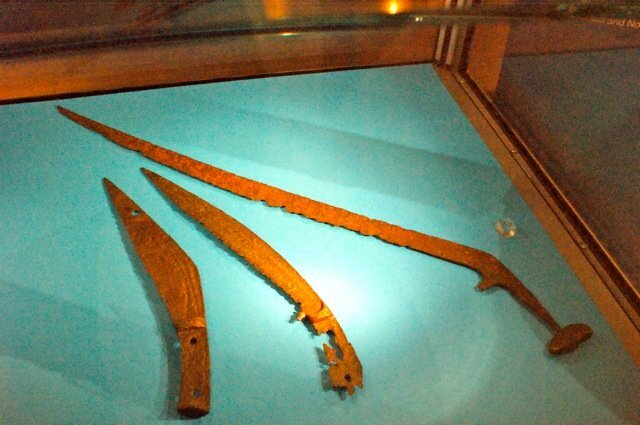 I also agree with the idea that the weapon "Machaira" and its cousins were designed to be held edge down, because of their use as slashing/cutting/chopping weapons. There is also a difference in the Falx family of weapons and the Sica. Both types have concave edges, but are different in size and character. I am still not 100% convinced that a roman writer would always make a clear distinction between these weapons when writing an account of an event. It is not unknown through history that writers are less than well informed or care much about exact or "proper" naming of different weapons. The use of the Sica as the weapon of the Thraex type gladiator show that Romans identified the weapon with warriors from Thracia. This does not mean the blade type was completely foreign, however. Only that the warriors of Thracia were famous in their success using this kind of blade. The word "Sica" was known and used by Romans.